There isn't a whole bunch of animated films coming out this summer as Pixar are set to dominate the market with 'Finding Dory'. 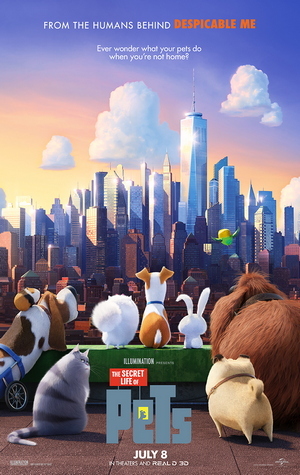 Dreamworks won't be sitting still though and bringing competition in the form of 'The Secret Life of Pets'. Coming from the minds of 'Despicable Me' and 'Minions', it would be sure to entertain, even if that were just so for kids. Spoiled dog Max (Louis C.K) and his owner Katie (Ellie Kemper) seem to have a perfect relationship together until Katie brings in a new dog. 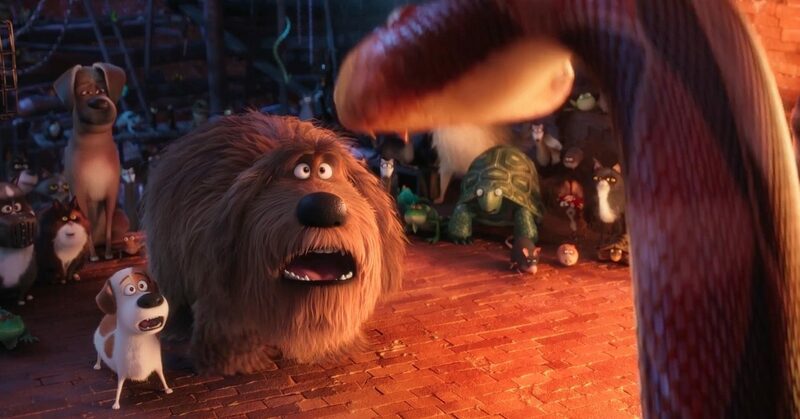 Duke (Eric Stonestreet), a large and clumsy dog is now sharing Katie's love with Max which causes a lot of conflict. The rivalry overflows and sees the duo wind up encountering dangerous felines and also the dreaded dog pound. They come across a psychotic bunny (Kevin Hart) who agrees to help them but only if the pair join him and his gang to bring the humans down. I made this point not too long ago when reviewing 'The Angry Birds Movie' but I feel that the situation is similar in this movie. 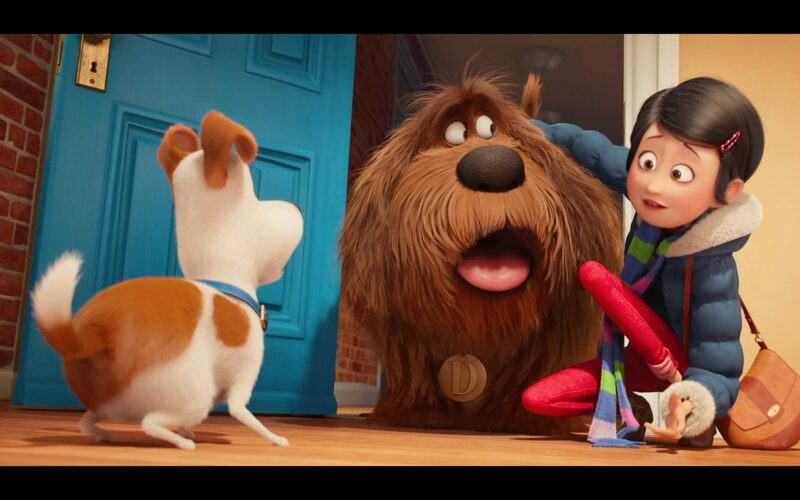 'The Secret Life of Pets' is most definitely made just to entertain children. I would say in that aspect it is a bit more mature than 'Angry Birds' in it both it's themes and also with it's humour. This also does make the film a lot better and more enjoyable for the members of the audience who have brought their young ones to see the film. The film takes a look at just what our pets do when we are we not home and thy are left to their own devices. The start of the film showcases a wide range of animals and what they get up to which is entertaining for both parties. From the slightly realistic to the bizarre, this does take an interesting and fun look at what our pets may get up to. Of course, this is also creates a great viewing for kids as the humour is perfect for them. The film actually surprised me in the route that it went. It leaves the setting of the pets being at home and now becomes an animals lost in the city movie. Now this has happened quite a lot with animated movies but I don't recall any taking the same steps as this film did. Duke and Max come across a bunny, who looks soft and cuddly yet is a menace and the leader of a vicious gang of animals who look to get revenge on humans. The film essentially them becomes quite vicious which certainly surprised me considering it looked to be just a harmless and cute film. Of course it's not blood and guts but there is a whole load of threats throughout many of the scenes. It's harmless to the audience and won't be frightening and the film does do well to try and incorporate its humour into these scenes. 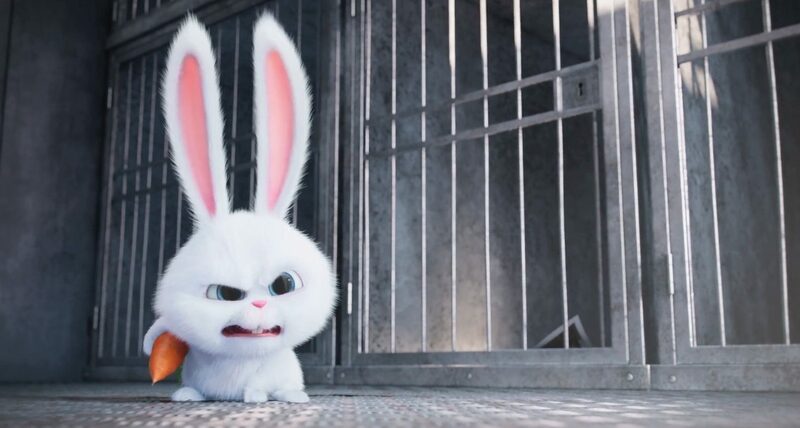 Kevin Hart lends his voice to the bunny in this film and he is fantastic. His voice is perfect for this character and he pulls it off phenomenally well. Hart's delivery is phenomenal and his voice is usually entertaining enough on its own and it shows in this film. He is the standout in this film and that may be down to his character being given more to work with, Louis C.K and Eric Stonestreet are fine in this film too and do provide some good moments in the film. The film is entertaining at times and does succeed at its job for entertaining children. However I cannot say that this is an animated movie that adults will get enjoyment out of for the full run time. This is clearly due to the film not being targeted to this audience and it really shows. The film had opportunities to go a bit deeper, including a scene which could've created a moment that could've devastated the mature audience but they didn't handle it nearly as well as it could. This really showed that the intentions was just to create a child friendly, fun movie and to be fair they succeeded in doing so. The film is entertaining at times and should do the job to entertain younger audiences. However adults won't get as much enjoyment from this one so I cannot recommend seeing it unless you are taking children to see it. So have you seen 'The Secret Life of Pets'? If so what did you think of the film? I hope this review was useful for if you were planning on seeing the film or not. Once again, thank you for reading my review, it is much appreciated!